This is a dress coat for a hunt ball. 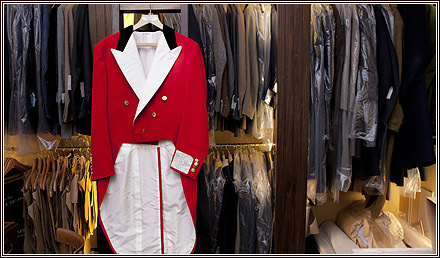 You can tell because the lapel is white – on an actual hunting coat the lapel would be red. The collar varies depending on the hunt the wearer belongs to. This one is black but we made another for an Irish lady last year with a green collar. The buttons, equally, are specific to the hunt. Most customers know exactly what they need, all the colours and specifications, when they come in. We don’t get many commissions to make hunting coats any more. Perhaps one a year. Partly because it’s been made illegal I suppose, but it was dropping off for years before that as well. The lack of regular work can mean you get out of the habit of it, but we have a few reference books that we use for any unusual pieces. The biggest and most regularly used is Thornton’s Sectional System. Others include books specific to various regulations and military uniforms. Some clients use old books like this to come up with very unusual commissions – coats with a three-part back like the frock coat, for example. We do fewer uniforms these days as well. It was never a big part of the Anderson & Sheppard business, partly because the amount of work required was great and the amount officers had to spend relatively little. I suppose the houses that did do it saw making uniforms as a good way to win clients that would likely have civilian clothes made there as well.